A confession: I was moved to tears by yesterday’s marking of the 50th anniversary of the March on Washington and Dr. Martin Luther King’s “Dream” speech, which articulates so beautifully the idea & ideals of America. There’s a certain pomp-and-circumstance that Americans sometimes just get right about recognizing important events and figures as they recede into history. But I often ask myself: Why can’t we become as good at understanding our own present-day American culture and the wider world around us? 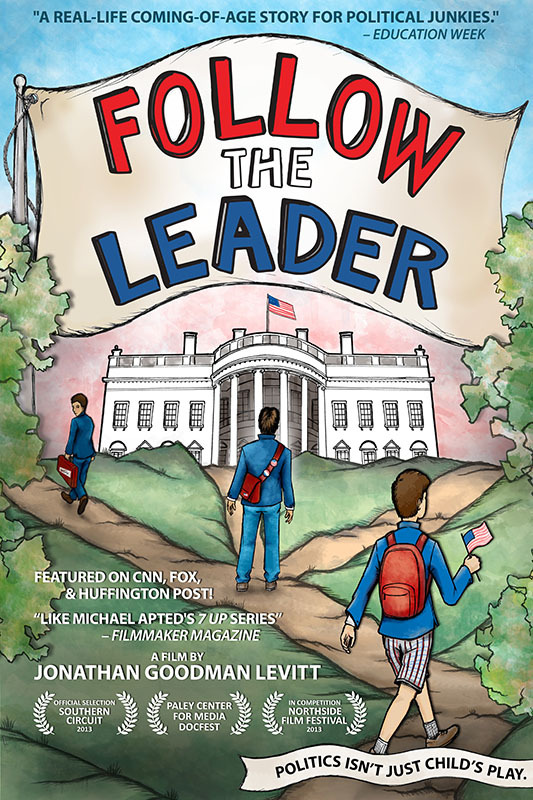 Much has happened since FOLLOW THE LEADER‘s twin World Premieres during the Republican & Democratic National Conventions exactly one year ago. This fall brings several new and exciting opportunities to see the film in the U.S. that coincide with the start of school and the anniversary of 9/11 – an immensely formative event for the film’s millennial participants. It’s also worth noting that Ben’s mentor featured in the film is Virginia Republican Ken Cuccinelli, who’s now neck-and-neck in the most competitive Governor’s race in the country this campaign season against former Democratic Party Chair Terry McAuliffe. • Host a College & Community Tour event: Right-click to download our Invitation or just get in touch. • Bring it to your local AMC, Cinemark, or Regal cinema via Tugg.com: Easy & no-risk, you create an event for free and encourage people to buy tickets online. If a minimum number of tickets sell, Tugg delivers the film directly to your local theater, simple as that! Since 2009, Changeworx and Manjusha Films have been producing films about Pakistan’s troubled modern history, Islamic fundamentalism, and the educational opportunities (or lack thereof) for Pakistani children today. Our first finished film together, SHABEENA’S QUEST, aired on Al Jazeera internationally last year, and will be seen on brand new channel Al Jazeera America in the coming weeks (check listings). Our larger project, also directed by the fearless Hemal Trivedi & Mohammed Ali Naqvi, will provide viewers with access to the private world of the highly influential Red Mosque madrassah (religious school) network – through the intimate stories of its Chief Cleric Maulana Abdul Aziz and two of its students. As the central front in the “war on terror” is arguably shifting to Pakistan, TWO CHILDREN OF THE RED MOSQUE will provide unique insights into one of world’s most misunderstood countries. We’re very grateful to Ford Foundation, Tribeca Film Institute, Center for Asian American Media, Sheffield Doc/Fest’s MeetMarket, IFP, Chicken & Egg Pictures, Influence Film Foundation, and Women Make Movies for their generous support. You’ll be hearing more about the film and our progress as we move toward completion in the coming year. Since last summer, we’ve been grateful for a steady flow of interest in REALITY CHECK INTERACTIVE. A participatory game and social experiment, RCI is a presentation format that breaks non-judgmental feature documentaries into episodes alternating with interactivity. REALITY CHECK deepens engagement by making viewers active participants who share their responses about a film’s characters, ideas & related issues. (Right-click to download our Press Kit & read the FAQ for more info.) REALITY CHECK: FOLLOW THE LEADER INTERACTIVE has seen limited touring as a live event that receives off-the-charts ratings, but putting on a live performance event can be prohibitively expensive. So that more people can participate, we’re in the midst of translating it into an online, on-demand interactive experience. Next month, we’ll be providing a brief overview at the Storycode New York transmedia MeetUp on September 17th, and giving a talk with demonstration at the Storycode DC launch event on September 24th during the Media Rise Festival. The goal now is to have a beta version online by next Spring after rounds of user testing, so that it can influence political discussions leading up to the 2014 midterm elections. Before closing out this season’s Changeworx E-news, one final announcement: The 10th Anniversary of SUNNY INTERVALS AND SHOWERS will be celebrated in the U.K. in November with a screening & panel discussion at the London International Documentary Festival. We’ll also be releasing a 10th anniversary DVD this winter with a new commentary from Allan (pictured when I saw him in June, left) and plenty of other extras. If you’d like a copy of SUNNY INTERVALS, the only way to get one now is to contact Changeworx directly (please do! ), but we’re also hoping to announce wider availability soon. Thanks for the privilege of writing to you every few months to share our progress. Links to our social media along with other sites mentioned in this email are listed below: If you do share a link(s), please know it makes a real difference! I’ll be at the screenings next month, and then at the IFP’s Independent Film Week in New York later in September…please be in touch if you want to meet there to discuss our projects our yours!